When your little one is ready for a toddler or big kid bed, it may be time to consider a bed rail. Safety is important to all parents, grandparents and caregivers. Using a bed rail prevents topples out of bed that can lead to your little one being hurt. There are some simple solutions to keeping your toddler from rolling or falling out of bed. Putting the bed against the wall covers one side of the bed and adding a bed rail or bumper to the other side will keep your little one as snug as a bug. If you prefer to not to use a wall two bed rails can be used together. There are also some great tricks, tips, and DIY options for keeping a child safely in their bed. Refer to your cribs manually to see if the size will fit. Requires minimal assembly for a quick, easy installation. Storage pocket for toys, etc. How Do Bed Rails Work? Most bedrails work by sliding under the mattress and creating a barrier on one or both sides of your youngsters bed. 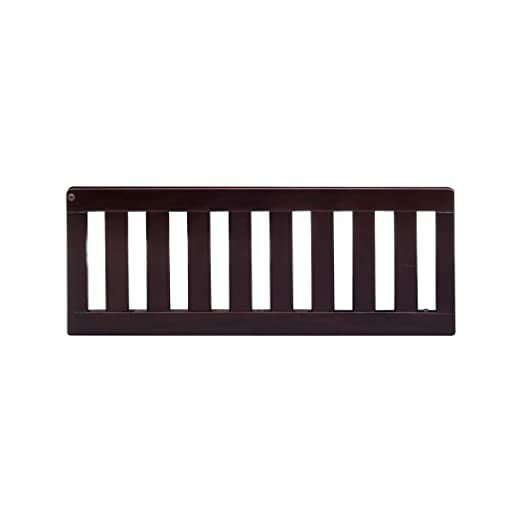 Other bed rails are meant to be used with certain cribs that can convert to a toddler bed. These are normally purchased as an add on product. Some bed rails, usually made from a foam like material can be placed on top of the mattress. The foam type of bed rail offers a lot of versatility. Some children gently bump into the bed rail and instantly roll back over. Other children are more boisterous and need a sturdy barrier to keep them safe. Whatever the style of bed rail, there is a variety of options to meet the need of any child. Bed rails are a great tool to have to keep a child safe in bed. If you are handy with carpentry, there are some great tutorials online for building bed rails. There are also some very simple diy solutions anyone can do. One trick is to tuck two pool noodles under a fitted sheet on either side of the bed. Doing this creates a barrier for your child. Keep in mind pool noodles may not be high enough for larger children or heavy sleepers. Another option for a toddler that tosses and turns may be a trundle mattress next to the bed. Using a small mattress or gym pad will soften any falls. This may not be a good choice for a child that is startled by falling or is smaller. Lastly, you can simply place a crib or toddler bed on the floor. This is a fail proof way to make sure a rolly polly little one doesn’t get injured while sleeping. Using a pallette under your child’s mattress offers support, while staying safely at ground level. Some things to consider when choosing a bed rail are the child’s age, size, the type of bed, and the child’s sleep habits. Younger children will most likely need a high bed rail, since spills can be especially worrisome. Picking a bed rail with fun color options can help younger children become more excited about their big kid bed. Older children who have learned better sleep habits could use a smaller bed rail. Simply bumping into the rail when sleeping can signal an older child to roll back over. Taller children need longer bed rails so a child’s height needs to be taken into account. A smaller or more petite youngster can slip between certain types of rails. So if you have a tiny tot be sure to chose a rail that offers a snug fit against the mattress. It is important to note what type of bed your little one uses. Some rails work with all sizes and others are able to attach to convertible cribs. Lastly, if you’ve got a sleeping gymnast, you may want to skip the pool noodle trick and rails that lay on top of the bed and go for the under the mattress style bed rail. The Simmons Kids Slumbertime Guardrail allows you to extend the life of your toddler's crib by transforming it into a big kid bed. You should check your cribs instructions as this bedrail is not compatible with all models. It does however work perfectly with the Madisson Crib ‘N’ More from Simmons Kids. It comes in two colors to match varying decors and makes an excellent choice if you are looking to convert your crib to a toddler bed. This rail is 30 inches long and 12 inches high making it a good choice for an active sleeper. The Safety 1st bed rail is an affordable option for safeguarding against your toddler rolling and falling out of bed. This lightweight bed rail comes in just over five pounds. While it is light, the functionality and safety are key to this product. 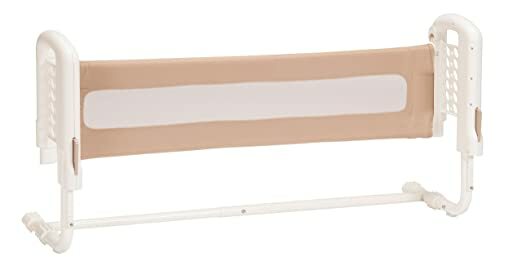 This bed rail uses an indicator to be sure it is locked in to the correct position, making it a great choice for parents or caregivers who may be confused about correct installation. At 36 inches long and 12- 18 inches high this bed rail is very difficult to roll over. One of the key features with the Safety First is that it eliminates dangerous gaps between the bed and the bed rail. The Safety First bed rail fits twin, full, and queen beds so it is one of the more versatile bed rail options. Another affordable option to safeguard against your little one from rolling out of bed is the Summer Infant single fold safety bed rail. At 42.5 inches long and 21 inches high, this bedrail is nearly impossible to roll over. The cool and unique feature about this model is that it can be folded down, which allows the parent or caregiver easy access to the bed, including linens. This feature makes for more simple laundry and quicker bed making. There is very minimal assembly needed, so this would be an excellent choice if assembly isn’t your strong suit. The Summer Infant bed rail can be fitted for a twin or queen sized mattress. Did I mention it was foldable and portable? Now you can travel with your bed rail and keep your toddler safe wherever you go, without taking up a lot of space. The Baby Home bed rail offers the most color options of any of the models, so you can find a color choice your baby or child will love. This model fits virtually any size bed and even works on platform beds. This bed rail is 19 inches long and 21 inches high making it another good option for acrobatic sleepers. Machine washable materials with breathable mesh, make the Baby Home bed rail a practical model for a messy toddler. Having a child means messes and this is a bed rail that can clean up quickly. The Baby Home is portable and easily broken down so you can take it on vacation or send it to grandma’s and grandpa’s house for sleepovers. This award winning bedrail is so versatile. It serves many purposes and makes having a bed rail fun for your toddler or big kid. It can be used as a bumper on the sides, at the headboard, or at the feet. It also comes with a pocket that your toddler can keep some of their favorite items close to them when they drift off to sleep. The Wall Bumpi is a triangular shape that is the longest of all the bed rails making it great for bigger kids. The Wall Bumpi is about 6 inches high so this needs to be taken into consideration if your child can easily roll over a bed rail. 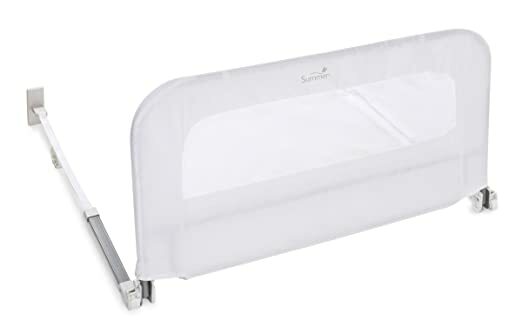 This is another bed rail that has a removable cover and the cover can be thrown right in the washing machine. 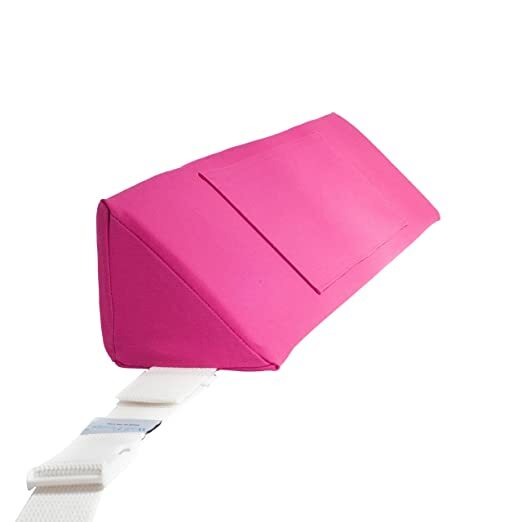 The Wall Bumpi is super lightweight and can be ordered in multiples so you can adjust the layout according to your toddler’s sleeping habits. It also comes in six different colors which makes it fun and adaptable for any bed room set up. If you are looking for an great american made product the Wall Bumpi is an excellent choice. Keeping your child safe at night is important. There are many options available to prevent little ones from falling out of bed. Whether you chose a DIY option or purchase one of the top rated bed rails, getting a better night sleep is just a quick installation away. Now your child can get a safe and good night sleep. You can too, knowing they are safe in their bed.